Jacob Leffler's Short Attention Span Theatre: Butchered Mail, Butchered Healthcare. No Thank You. Butchered Mail, Butchered Healthcare. No Thank You. I received this mail at my office a few days ago. 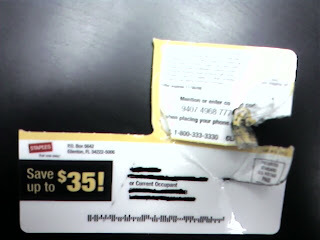 This mail was mangled compliments of our US Postal Service. This is not the first time this has happened. 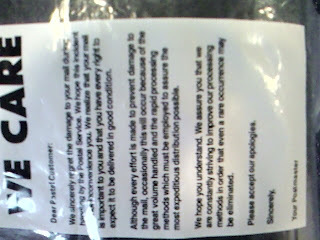 Here is the USPS message to me, saying they care, but offering no "make good" or solution to their problem. Basically they are saying, "We destroyed your mail, but we care. Have a nice day." Too bad for Staples, they are the ones actually paying for this direct mail to reach me, a potential customer, yet their mail never makes it. 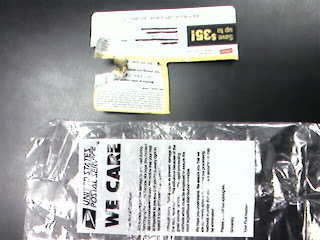 I seriously doubt Staples will ever get a refund from the USPS. I rarely make political statements on this blog. This blog is not a political blog, however extraordinary times call for extraordinary measures. My point? The group that destroyed my mail, will destroy mine, my companies and your health care. Is our current system perfect? No. Does it need a new approach? Yes. Is the government plan being proposed the answer. Hell no. Don't believe the hype, it is a highway to disaster. I am a small business owner, I have reviewed both sides of the debate and it is clear as clear can be that the US Government has no business owning and controlling health care. They cannot successfully deliver the mail, how can they control and manage the largest economy in the world's health care?